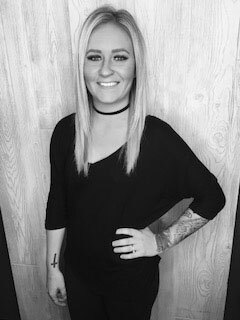 Known for her dexterous creativity and ambitiousness to always acquire new skills, along with graduating top of her class at the nationally-respected Aveda Institute Des Moines, Aly loves staying up to date on all the latest trends in hair, fashion and beauty. She’s also perfected her technique, focusing many hours of training and repetition in balayage, texturized cuts and curly hair. Aly’s passion is solely directed on her guests to find their inner beauty and confidence while making sure they leave relaxed and rejuvenated. Aly is one of the newest members to our bridal expert team. Her attention to detail and love for perfection when it comes to a guest’s wedding day has made her transition into this new role smooth and easy. Our brides love all the precision to detail and advice she gives while making them look and feel great on their special day.